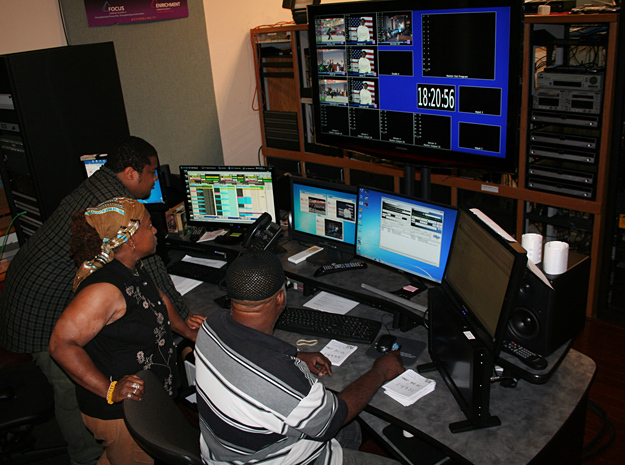 DCTV, a public-access television station in Washington, D.C., consists of multiple state-of-the-art media facilities responsible for distributing local programming on seven cable channels, as well as streaming online. DCTV has programs that air in a variety of categories, including entertainment, youth-oriented, public affairs, sports, health and cultural/international. One of the channel’s popular programs is “Student Exposure,” which is produced by students. The content is usually about nonprofit organizations in D.C., and the program promotes the great work they do at the same time it trains the next generation of local video talent. Of course, DCTV has a wide range of studio and field gear to accomplish its mission. When it comes time to get something new, the staff takes training and support into account, since many of the people using the gear will be volunteers with little or no video experience. To work new gear into the system, DCTV’s staff has to develop a training curriculum for that item, beta-test the curriculum to insure that the students understand what they are being taught and implement the curriculum by training all certified member/producers on the new equipment. This process can take up to 6 months. Because funds are modest and the people using the equipment have variable training and experience, all gear must be durable, dependable and user-friendly, and the manufacturer must have excellent customer service. Recently, DCTV updated the very core of its operation: the automation and management system. Managing the multi-channel operation using an older “industrial” system was proving to be both a challenge and an opportunity. Until the change, DCTV relied on its older system to acquire, manage and distribute media content across its multiple cable and online channels. Doing so resulted in silos, not only between channels, but also between departments. programming flowing smoothly in a DCTV control room. Pertinent program metadata was manually entered, duplicated and shared as needed between departments and channels, which required several labor-intensive processes among employees. Operating in such a manner became inefficient and created lengthy paper trails. A particular challenge was the need for master control to have to physically chase down missing content from a playlist. Due to the lack of metadata during playlist creation, it was often unclear which department was accountable for what and when. Having to use master control resources to track down content was tedious and time-consuming, when their time could have been better spent performing more technical tasks and maintaining the flow of programming. DCTV implemented Myers’ ProTrack, a broadcast management system, to advance the automation of its broadcast operations workflow. Read the full article, as published by Government Video, by clicking here. Help your digital broadcast workflow get down to business with the Accounts Receivable Add-On.